Welcome to Mollie Bakes! My monthly baking series that features, you guessed it, baking! Specifically, baking something that I want and have a hard time finding gluten free and as delicious as I want it to be. It’s tough! For April’s baking adventure, I went right for where it hurts: Pastry. No, I’ve never been scorned by an unruly croissant, and I’ve never been doubted by a finicky Danish, but that’s just the thing. I have not enjoyed either of those delicacies since my Celiac diagnosis in 2013. That’s over five years without eating these goodies that are deemed the king and queen of the brunch bread basket. Well, at least in my mind that’s what they’re called. You may disagree. That’s your choice. And yes, before you get concerned that I live under a rock (I don’t) or that I haven’t noticed that GF versions of these do exist in specialty bakeries (I know! ), my point is that gluten free pastries, of high quality and all natural ingredients, are not easily accessible to me ( I can’t hop a plane every time I want a fancy pastry). So, I did what any normal, Cheese-Danish-craving individual would do! I made my own. From scratch. Gluten free. Recipe: Cream Cheese Danish from the Vanilla Bean Baking Book by Sarah Kieffer. Memory Lane: While I do not have a particular memory associated with eating cheese Danish, I do have memories associated with pastries in general. Remember, I starting eating gluten free at age 27, which left many years for me to indulge in all of these treats before cutting them from my diet entirely. So, as you might imagine, I have eaten delicious Danish, croissants, and other pastries in the past, just not gluten free versions. While I pretty much avoid going into a bakery where I cannot buy anything, for some reason seeing photos of the treats I can’t consume affects me in a very different way. Photos provide me with the inspiration and determination to create my own gluten free versions of the beautiful pastries, desserts, and other goodies I see when scrolling on my feed. Make+Bake: I followed the book’s recipe exactly as written and did not cut any corners. 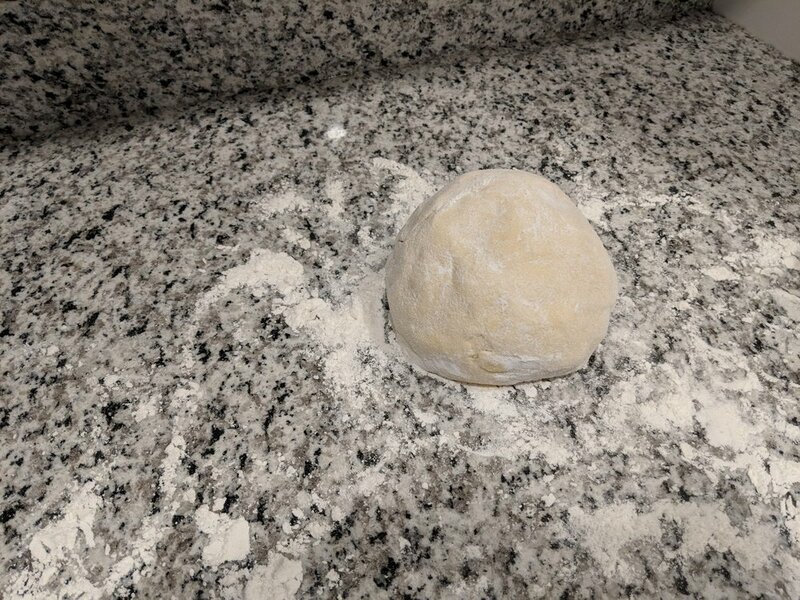 I waited the hours for the dough to rise as directed, kneaded (and folded) the dough many times, cut the dough/pastry, folded the corners, waited, baked, waited, frosted, and did it all over again. Baking Tips and Notes: The only change to this recipe was that I used gluten free flour by the company Cup4Cup (created by Chef Thomas Keller’s pastry team at The French Laundry). Joyfully, the entire recipe could be followed as written and with a little elbow grease and flour totally covering me, I was making pastry dough for Danish in no time! 1. Be patient. This process took two full days. 2. While the dough is difficult to work with, it does cooperate and the end result will be delicious. Have no fear! Keep your work surface heavily floured with GF four (but don’t get too much on the dough itself). 3. Be proud of your effort! Knead that dough and use your muscle! 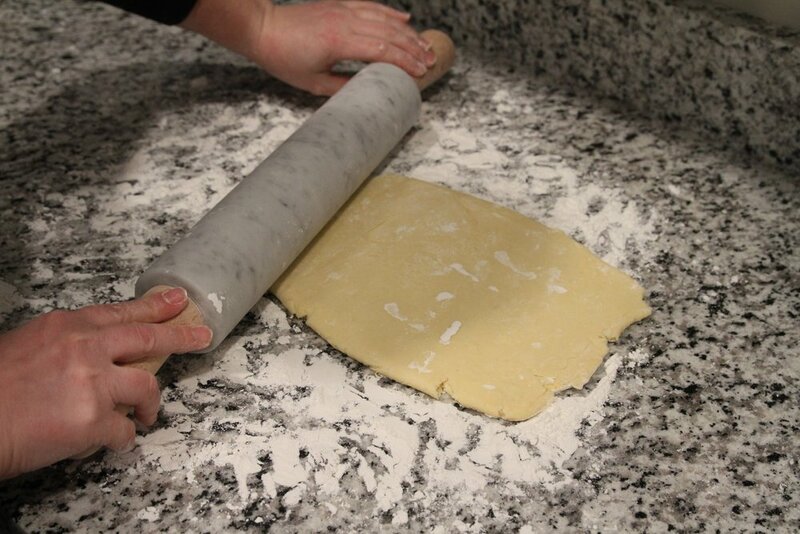 And the rolling pin is a fabulous tool. However, it does make the dough get very thin quite quickly. Pay attention to keep it thin, but not too thin since you don’t want it to break. 4. Prepare the cheese filling as instructed, but make it thicker than you plan. I learned that more filling per Danish, and thicker filling overall, is better for the final outcome. 5. Be careful when closing the Danish (opposite corners matching) because they will want to come apart, so be a little more forceful. They will possibly break a part while rising. A sad sight, but not the worst. See my next point. 6. Don’t skip the egg wash! It’s required before you let the Danish rise for the second time, before baking. Apply that egg wash them thoroughly. 7. Don’t get too mad when the corners of your Danish unfold while rising before being baked. While it seems like a catastrophe in the moment, it works to your (slight) advantage in the end. 8. You must let the Danish cool completely before drizzling the frosting. You must. Wait even longer than you want to. It’s worth it. 9. Frosting will shrink a bit after being drizzled onto the danish. It’s OK. Maybe add a little extra to compensate. 10. Your days of effort and time will only yield 6 Danish. Don’t be sad! They’ll be so yummy it won’t matter that they’re gone in an instant. 11. Make that second batch because the dough makes enough for a second round. Roll up your sleeves and get started! 12. Upon your first bite of that beautiful, homemade pastry, close your eyes and smile. You’ve just made a gluten free cheese Danish. From scratch! Conclusion: This was my biggest baking adventure yet! Detail-oriented, lots of time, lots of effort, and quite possibly the most delicious result yet! I was immediately enamored by my creations, and we ate them way too quickly. Delicious, slightly delicate, and the exact flavor and texture I was craving. For the record, Batch One, which is what you’re seeing in all of these photos, was delicious, if not exactly beautiful, in my opinion. Batch Two, those shown on the blue platter, were divine and beautiful (in my opinion). The second batch had thicker filling and corners that stuck together better when baked. A miracle. What’s Next? I’m not sure! Maybe a cake of some kind? Maybe another type of pastry? I’m leaning toward something that can be shared easily (well, that’s everything) and enjoyed for more than a few days. You’ll just have to wait and see! My pride and joy: Cream Cheese Danish. (Batch One).